England's World Cup campaign in Russia ended with a 2-0 defeat by Belgium in St Petersburg that meant the Three Lions finished in fourth place. Gareth Southgate's team were unable to bounce back from the despair of Wednesday's extra-time loss against Croatia in the semi-final in Moscow - but this still represents a highly creditable tournament for England. Thomas Meunier put Belgium ahead after just four minutes when he slid in ahead of Danny Rose to divert Nacer Chadli's cross past goalkeeper Jordan Pickford. England had chances to level in the second half as Toby Alderweireld cleared off the line from Eric Dier, while Harry Maguire also headed wide from a good position. Eden Hazard wrapped it up for Belgium with eight minutes left when he got the better of Phil Jones to beat Pickford, who had just saved magnificently from Meunier, with an powerful finish. Belgium striker Romelu Lukaku missed two chances and was substituted without scoring, leaving England captain Harry Kane in pole position to win the World Cup's Golden Boot with six goals. Kane will collect the award barring remarkable deeds from France duo Antoine Griezmann and Kylian Mbappe, who are on three goals apiece, in Sunday's final against Croatia in Moscow (kick-off 16:00 BST). Southgate made five changes to the team beaten by Croatia - but there was still a clear determination to secure their best result at this tournament since 1966. And with Belgium counterpart Roberto Martinez adopting the same approach, it made for an entertaining play-off in this magnificent arena in St Petersburg. It would have been easy for England's heads to drop after defensive sloppiness from Danny Rose - who allowed Meunier to slide in on his blind side - led to them falling behind so early. 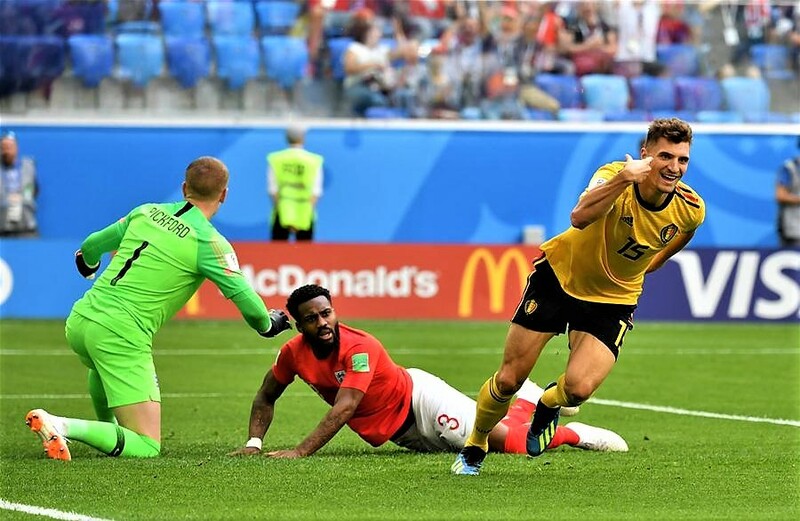 England, as others have before them, struggled to cope with the variety of Belgium's attack, but their attitude was once again commendable and they had chances to pull the game level before Hazard snuffed out their hopes. Dier's clever chip was miraculously cleared off the line by Alderweireld, before he and Harry Maguire headed wide from good positions as England pressed. This is a fixture regarded as an unwanted intrusion for teams who have suffered the despair of a World Cup semi-final defeat, but Belgium and England made it competitive. It was, in some respects, a game too far for England after the disappointment of Wednesday's loss to Croatia - but to go home having finished fourth at this spectacular World Cup in Russia is no disgrace.